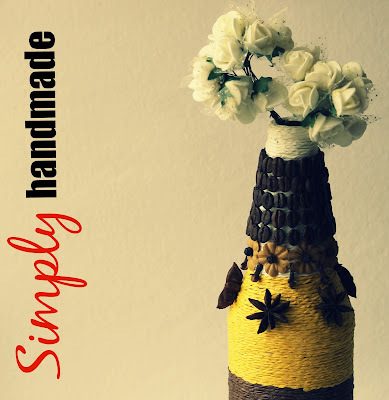 hello friends, standing on the last day of the month I have a quick post on another bottle that I upcycled. This one is a little different. I have used an old bottle, used hot water to remove the label. Later I used gesso to apply a base coat. Used 4-5 color twines to wrap around the bottle. 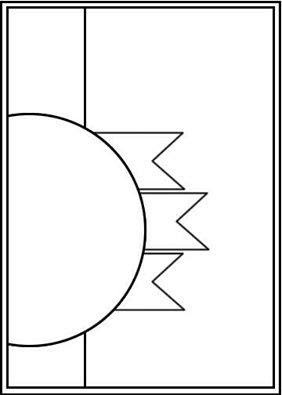 You can use normal glue/tacky glue for the same. Below is the look it has. I wanted something for the kitchen or the dinning space and hence used coffee beans, cloves and some spice from my kitchen inventory. Used Prima flower and black pepper for the buds. Later I used star anese to add the last line. Trust me it was such a fun project and I loved making this. Hope you all like it. I have loads of stuff coming soon so stay tunes. 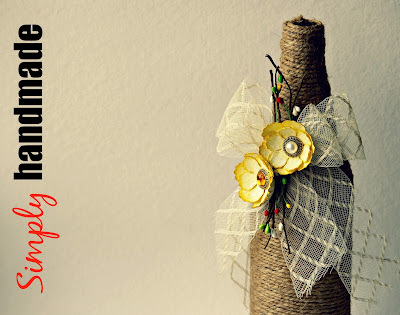 Oh yes and do participate in the giveaway here to have loads of embellishments for your kitty. Below is the giveaway prize, dont forget to subscribe. XOXO, see you at the next blog! Hello Crafty peeps, hope this finds you in good health. 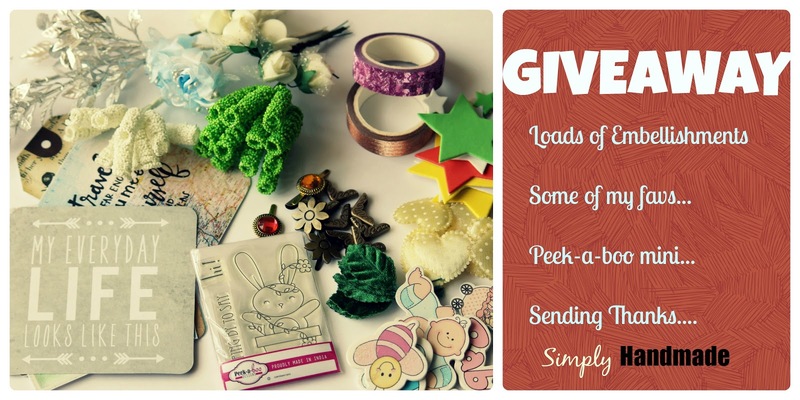 We are already in the last leg of the month and I am excited I have a giveaway going on in my blog! 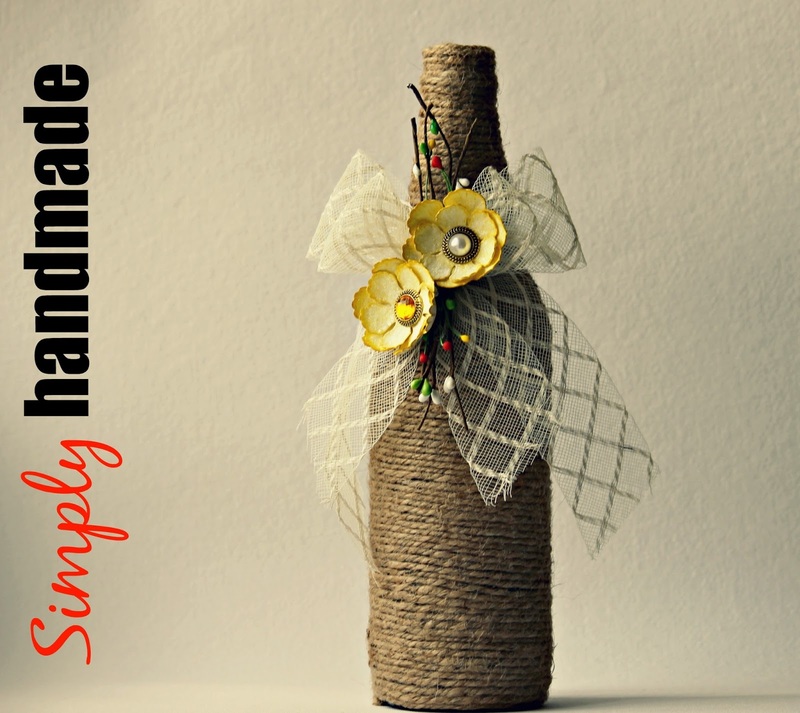 This is the first time I am trying my hands in decorating a used bottle to use as a home decor. My sister helped me wrap the twines and I have many left bottles already wrapped by the way :). I have used jute twines to wrap the bottle. 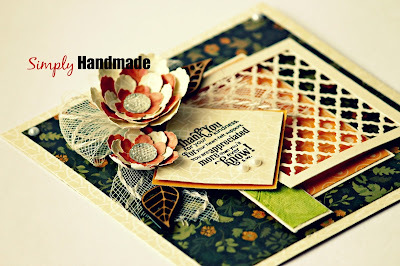 Used Heartfelt Creation Botanical Rose die for the flower ( which I cant do without ) :) :) :). Later I used some Lace to make the bow. for the based on which I used twigs and flowers to decorate. I am loving the way it has turned out and I am out to make some more so coming more soon. Hope you like, do share your comments. 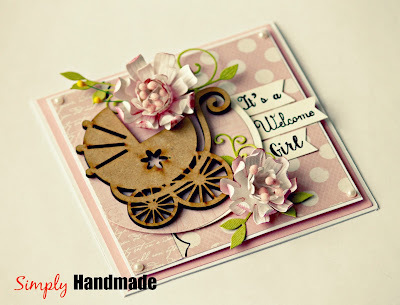 Yes to celebrate the success of my page, my little craft endeavor I wanted to thank each one of you for their support and appreciation. Please visit HERE to enter the giveaway. And thank you all who already commented and entered the giveaway. I have been planning for this giveaway for a long time now however never really got to plan and structure it. So whats this giveaway for, well for lot of reasons. First and foremost its just a way I thought I would thank all of you for liking my work, appreciating my projects, making me a winner in challenges or listing in top three or just a " like" for my work. 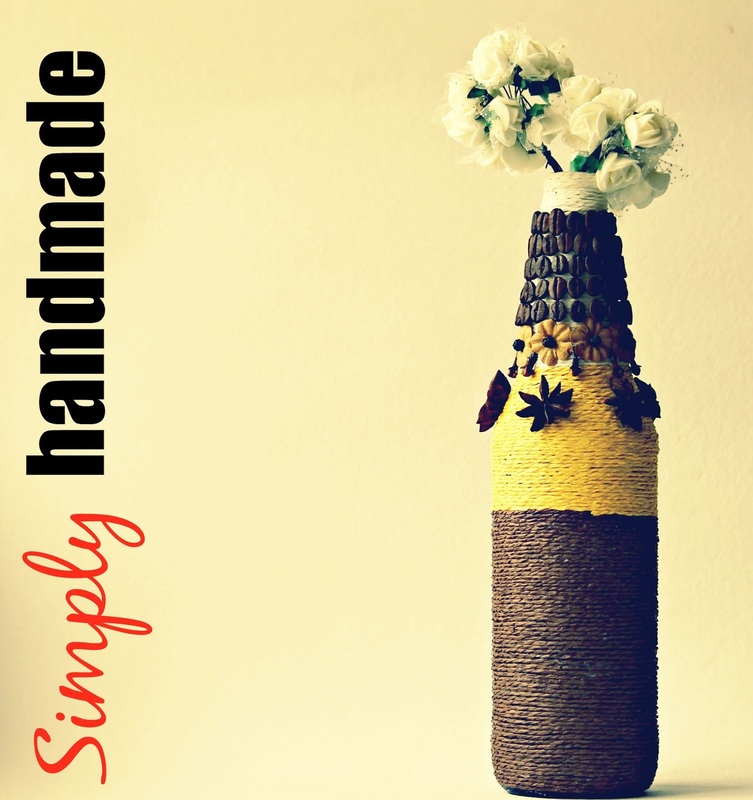 My handmade Store " Its Simply Handmade" is good 2 years now. We do not have any online website as such however mostly its through exhibition that we hold or facebook , email, friends and family. We have successfully exhibited in 2 big forums where our products have been liked a lot. I love to create and so each one of you who has made the tiniest purchase gave me the reason to create more. Second, my sister has finally joined my crafting venture with her handmade jewellery product line and her work is been appreciated a lot for which I want to thank each one of you for your presence. Hence, I want to express my thanks by sharing some of my favourites with you in the form of this GIVEAWAY. 1. Like my page Here and share it on your page to help others know. Once you have done all three, please leave a comment here below this blog! 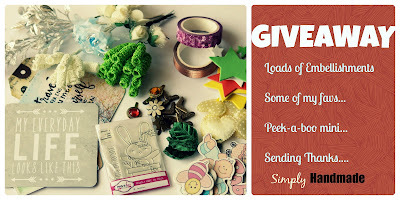 I will choose a random winner from the comments on this blog. The Giveaway will close on 15 October post which I will announce the winner on my blog and facebook page. So lets get the ball rolling, I am very excited since its my giveaway and once again want to thank each one of you out there! 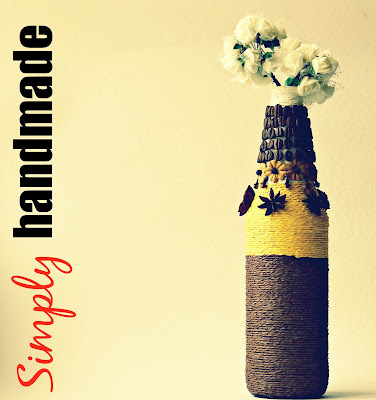 Hello Everyone, hope this finds you in your crafty space. 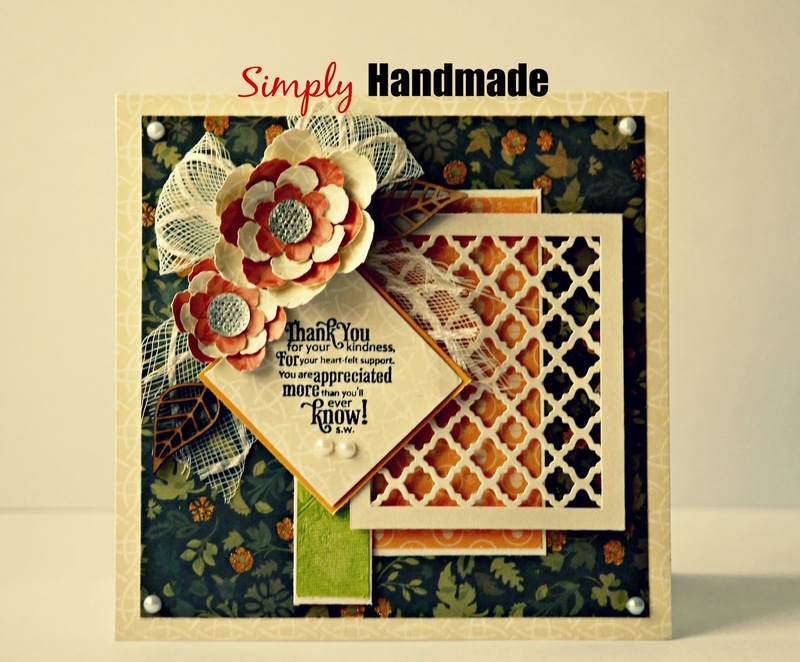 Today I have a very simply card to share however I had fun creating this one. I love water coloring and specially since I have found the perfect papers for water coloring. Today I used a Peek-a-boo stamp set and used one of the flower bunch to water color. 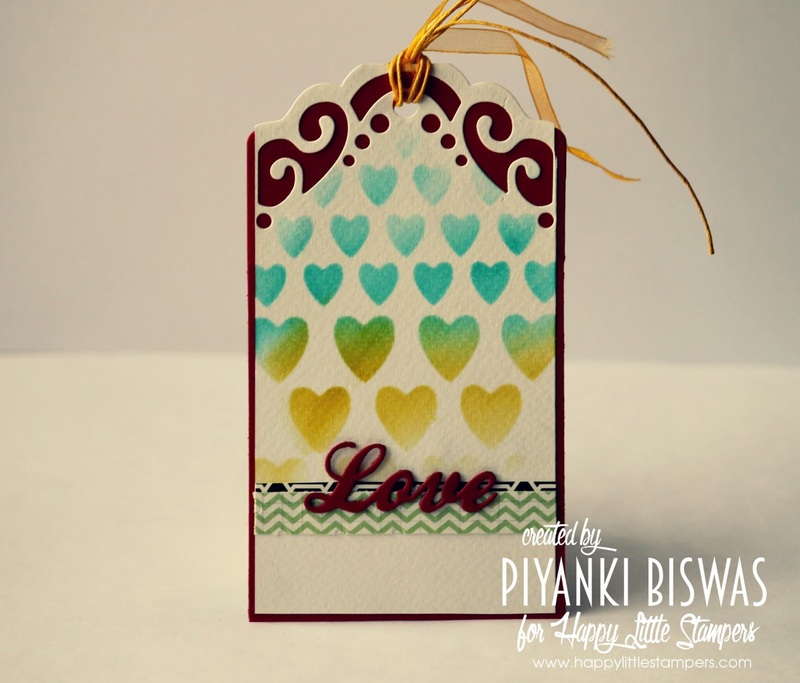 I stamped it three times with Archival black ink and colored using luna water color pencils. Later I fussy cut all three stamped images. I also made some extra leaves to add dimension. Used a Neenah Solar CS for my card base and using distress ink made a background using another stamp from the same collection. 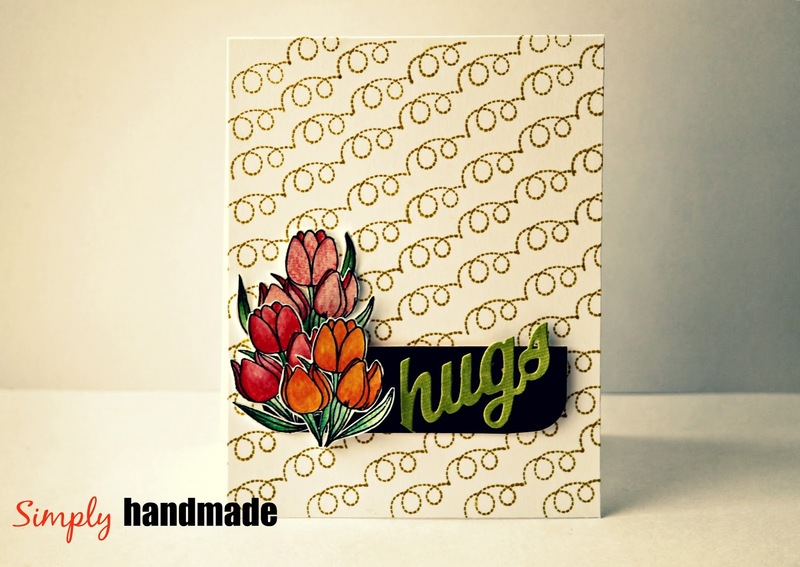 In order to add a sentiment I used a Die-namics die " Hugs" which comes within a heart. I chipped off the border and used the word only. 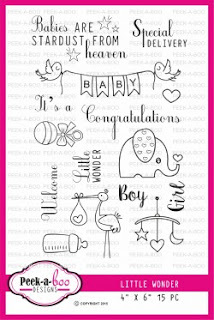 So here we go with the card below. Hope you like it and do leave some comments. 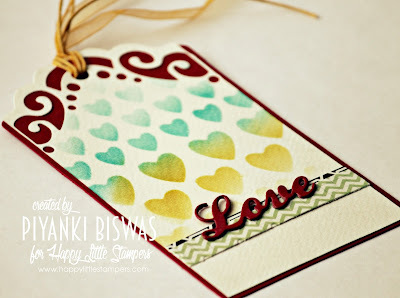 I am back here for my DT post for " Anything Goes with Dies" for Happy Little Stampers. So I have made a tag with some stenciling. here I present my tag for this month. Its time for Mojo Monday and since its the first Monday, we have contest going round. With much further ado, I am showcasing my card for the Mojo Monday Sketch Challenge. 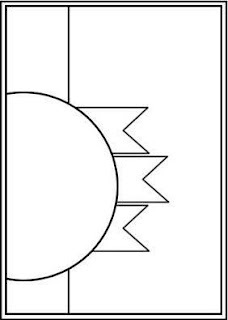 The below is the sketch for which the card was interpreted. Hope you all like it. Do share your comments. Hello September and Hello Friends ! 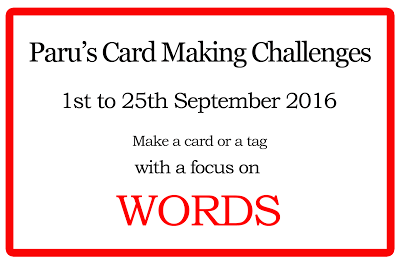 There are some amazing challenges around which allows me to showcase my card for the month. 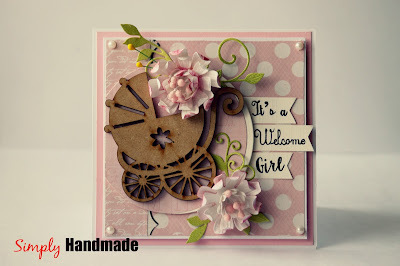 I loved and enjoyed making this card as it has been in my list for many days to make a baby girl card. Peek-a-boo's sketch challenge also inspired me to choose the sketch for my card. Before further ado, here's my project for today. The flowers are handmade and are heartfelt creation dies. 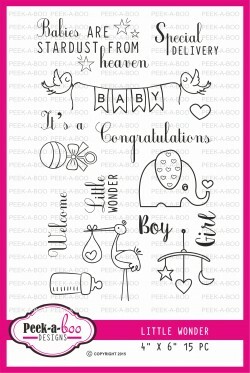 The paper is from Pitter Patter and pink being girl theme. The PAB sketch is as follows. Hope you all like it and share your comments.